More than 200 years ago, an Indian migrant from Patna opened Britain's first curry house at George Street in London. Sake Dean Mohamed, who served in the army of the East India Company in colonial Bihar before leaving for London in 1782, opened the first standalone Indian restaurant, Hindostanee Coffee House, in 1810, hoping to cash in on Britain's love for curry—a short-hand for 'what Indians eat'. There were other restaurants serving 'Indian' food back then but Hindostanee was the first one to be owned by an Indian. Along with breads and chutney, the menu had "pineapple pullaoo", "chicken currey" and "coolmah of lamb or veal". As recently as June this year, the 25-dish "bill of fare" (or menu) from Hindostanee, found in a handwritten cookery manuscript, was auctioned off at the London Book fair for $11,344 (Rs 7.6 lakh). But Mohamed had to sell his establishment serving ‘Indianised British food’ within two years of its launch as it turned out to be an unsustainable venture when eating out was hardly fashionable. But even in a thriving dining out sector in 2018—with some 17,000 Indian restaurants in Britain—it is said that curry houses are fast disappearing in the UK. In a statement released by the Asian Catering Federation (ACF) in 2017, the chairman of the federation has predicted the closure of half of Britain's curry houses in the next decade due to rising costs and changing tastes. But British/Indian chef Romy Gill, who migrated to the UK from Burnpur in West Bengal, is unfazed. 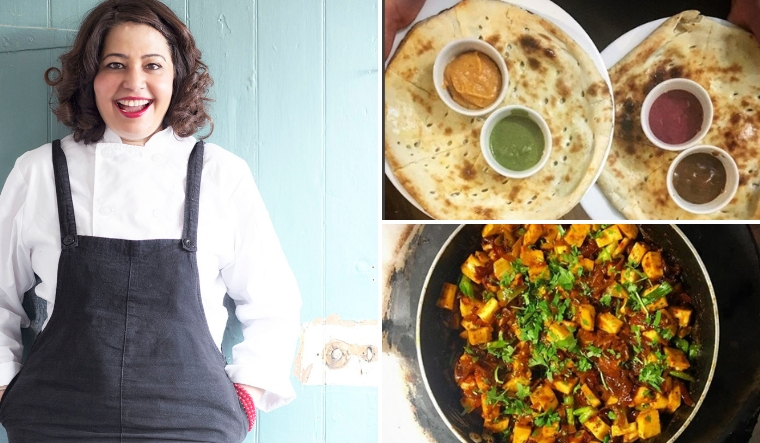 In this challenging environment of "curry crisis", Gill has defiantly carved a niche for herself with her "modern but faithful Punjabi-Bengali cooking" at Romy's Kitchen—a restaurant she opened in 2013 at Thornbury, South Gloucestershire. In 2014, Romy was shortlisted for the 15th Asian Women of Achievement Awards. The same year, Romy's Kitchen was shortlisted as "Best Newcomer" in the British Curry Awards. She is one of the few female Indian chef-owners in the UK restaurant scene and was appointed an MBE in the Queen's 90th birthday honours list in 2016. Gill will be a guest at the Tasting India Symposium 2018 to be held in Delhi from December 13 to 16. The symposium is an international food policy advocacy initiative to promote global dialogue on gastronomic heritage and culinary tourism potential, farm and agri-tech innovations and sustainable food culture. What do you remember of your days growing up in West Bengal? What are your memories of food and flavours from the industrial township? We did not have gadgets like kids have now. Our life revolved around food or playing cricket or badminton with my friends. We did not have much money so my friends and I would share the food together. Street food played a major part and the best ones were jalmuri, puchca, chaat kati roll or hakka noddles. My food is very much influenced from street food. What were some of your initial struggles to get Romy's Kitchen off the ground? I had to go through many struggles and sacrifices and still going through the same. It took me three and a half years to get a change of use to a restaurant. As a woman who has never run a restaurant and hardly worked in one, banks refused to provide me with a loan to open a restaurant. I used my jewellery and savings to open a kitchen and then, BBC did a feature on me. With the impact of the BBC feature, I got a loan from the bank. Anyone in the right mind would have given up but I did not. How have you tried to reinvent Britain's long-abiding love for curry, beyond the fiery Vindaloo and Chicken Tikka Masala? What is your recipe for standing out in a culinary landscape of more than 15,000 curry houses? We should give a lot of respect to the curry houses—they introduced the British people to the flavours and fell in love with spicy food. We would not be here today if they had not opened those curry houses. So we must not forget the people who actually put us there. My food is not five pints of lager and curry, it is the food that I have eaten while growing up and using the ingredients that go well with the spices. Tamarind octopus among many other dishes are very popular. What are the new trends coming out of London for Indian food? Dishoom changed the outlook of Indian food, it is very reasonable and delicious in taste. Then came the wealth of investors to open restaurants here in the UK. Mostly, Indian restaurants are pushing boundaries to gain Michelin. My favourite is Gun powder and Kricket—keeping the flavours and pushing the boundaries. Trends come and go its; all about flavour for me. What is the most ordered dish in your restaurant? All the dishes are very popular but samosa chaat, butter chicken, baingan bartha, tandoori quail, octopus, goat, crab and venison are very popular. But then again people just come for vegetarian food, too. How is Brexit expected to hit owners of Indian restaurants? Surely it is going to hit the hospitality industry, not just the Indian restaurants.